Hello! 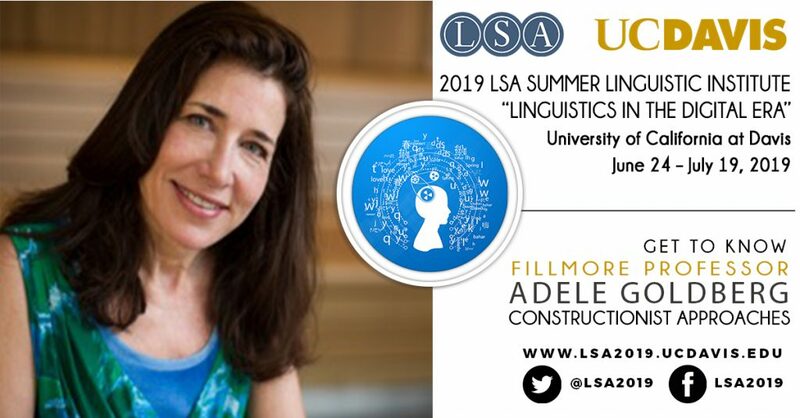 I’m looking forward to teaching at UC Davis in 2019, which will be my 7th time teaching at an LSA Institute. Each Institute is unique but all have been incredibly interesting and rewarding. The course I will offer is based in part on an upcoming book, Explain me this: creativity, competition and the partial productivity of constructions (Princeton University Press, 2019). It will address certain long-standing puzzles including, how do we use words and grammatical patterns in new ways without overgeneralizing? Why have certain experiments found children to be more conservative learners than adults while other work seems to have found children to be especially eager generalizers? Why do second language learners have more trouble recovering from errors than eight-year-old children? If there is no Universal Grammar (i.e., no grammar that is universal), why is it that we learn language and chimps don’t? I don’t assume any previous knowledge, and I hope students who attend have a variety of backgrounds. I stumbled into linguistics after majoring in math and philosophy at Penn. It wasn’t until after I began graduate school that I became passionate about what language could reveal about the mind. At that point, I transferred into the linguistics department at Berkeley and took courses in psychology, development, CS, AI, and education as well as linguistics. I’ve been a faculty member in the linguistics departments at UCSD and UIUC and in the program at Princeton. I recently transitioned into Princeton’s wonderful psychology department, where together with a team of graduate students and colleagues, I investigate how language is learned, used, and represented as a means of communication. The field of linguistics is rapidly changing and I believe it’s essential to have a solid background in methods, whether that involves corpus collection and analysis, experimental design and statistics, or simply careful elicitation techniques. Language lies at the intersection of half a dozen fields and so linguistics can take you in many directions. Be open to new topics and by all means, enjoy the journey. I have very few talents, so I feel immeasurably lucky to be able to do what I love. I look forward to getting to know you, to sharing a coffee or a crepe, and to thinking with you about learning, memory, communication and constructions.